If you live in a city or a suburb or within shouting distance of a Walmart  anywhere, in short where bright lights shine all night  you may have forgotten, if you ever knew, how humbling it is to see the stars in their full glory. I remember a trip to a mountaintop observatory in Arizona where it seemed as though the Milky Way and the constellations were so bright and so close there was an almost physical, touchable quality to them. It was both breathtaking and faintly unnerving. Ian Cheney hasn't forgotten what the night sky looks like  or at least should look like. After he moved to New York City in 2008 to work as an independent filmmaker, he quickly realized how much extra effort he had to make to reconnect with the natural world he'd known as a kid. Finding a bit of green space in New York City or taking a walk by the ocean was possible, of course, but it wasn't easy. He was especially struck by how he missed the stars. "When I was young," he says, "I was fascinated by the sky, fascinated with stargazing." But from New York City, on a good night, you can see maybe a dozen stars, a tiny scattering out of the many thousands that are theoretically visible to the naked eye. You or I might quietly mourn the loss  but Cheney, who co-directed and co-starred in the Emmy-winning 2007 documentary King Corn, about American agriculture's unhealthy fixation on corn production, turned his cosmic yearning into a film. 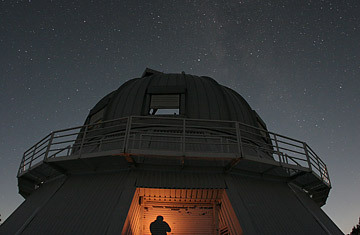 Titled The City Dark, it explores how much we're losing as 24-hour, artificial lighting wipes the night sky from view. If this were a Nova special, you'd have 3-D superslick graphics zapping into view from all directions, and interviews with real people  world-class experts all  with shadowy lighting and portentous music setting the mood. Not here, and thank goodness: The City Dark does have its superstars, including the Hayden Planetarium's Neil deGrasse Tyson, who reminisces about visiting the Hayden for the first time as a child and thinking that the depiction of the night sky had to have been exaggerated because he'd never seen anything like it himself. But the real stars of The City Dark  aside from, well, stars  are the characters Cheney somehow found, including a professional astronomer who still manages to study the heavens from light-saturated Staten Island; a scout leader who takes New York City kids far outside the city to experience the night sky themselves ("Hey," says one, "there's, like, a hundred stars up there! "); an oddball lighting-store owner who may be part of the problem but whose love affair with bulbs is nevertheless charming; and an amateur astronomer who created a place called Sky Village, in Arizona, where he and his fellow enthusiasts can stay and indulge their passions, unhindered by glare. "I wanted to keep the film rooted in my personal journey," says Cheney, "and as result, it's full of the quirky and fascinating characters I met along the way." In keeping with that aesthetic, the graphics and animations, produced by a gifted filmmaker named Sharon Shattuck, are quirky, low-key and totally engaging as well. It turns out that more than just astronomers and lay stargazers are hurt by the loss of dark skies, as Cheney discovered on that journey of his. So are birds, which can get confused as they try to migrate (4,000 birds a year crash into buildings in Chicago, for example, drawn to the city's lights at night). So are sea turtles, who rely on the relative brightness of the beach at night to find their way ashore and lay their eggs, and now find it harder to distinguish sea from sand from sky. And so, suggests the film in a segment built on somewhat shakier ground, are breast-cancer victims: some researchers theorize that round-the-clock exposure to artificial lighting alters hormones in a way that can trigger the disease. The theory isn't crazy, but it's further outside the mainstream than The City Dark makes sufficiently clear. While the film lays out how much artificial lighting has taken away from us, Cheney freely acknowledges that it's hugely beneficial in all sorts of civilizing ways  reducing the risk of crime, to name just one. He isn't arguing that saving the turtles and giving astronomers better viewing conditions is worth bringing back gaslight, candles and kerosene. But he does show how sensible regulations can make a difference, requiring that streetlamps direct all their light downward rather than throwing half of it uselessly up at the sky, for example. All of this is important stuff, but perhaps the most important thing The City Dark has to tell us is that by losing touch with the stars, we've lost touch with something that inspired our distant ancestors in a profoundly spiritual way. It's no accident, observes Tyson at one point, that so many ancient peoples focused their religious yearnings on the stars  mysterious, glorious beacons that blazed down from skies unpolluted by city lights. Those stars may not become any more visible soon, but the movie will. Check out its website for screening schedules, or look for it on PBS's POV series, probably sometime next summer.